Order in the next 1 hour, 21 minutes an 27 seconds for same day shipping. 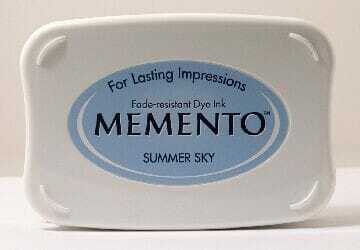 Summer Sky Memento dye Ink Pad for Stamps is fast drying and fade resistant. The innovative pad delivers finer impressions and exceptionally even coverage. Customer evaluation for "Tsukineko - Summer Sky Memento Ink Pad"